As a grandmother of 3 darlings, my heart is full of love for them even though they are far away. Us grandma's are softies and also barracuda's when we protect them. We also have so much happiness and joy when we play with them because we simply send them home when they are done, well it really is because we are more relaxed and seasoned. I want to pay a tribute to Grandmothers of all ages before the holidays as we make them more special and create great memories for our grandchildren. 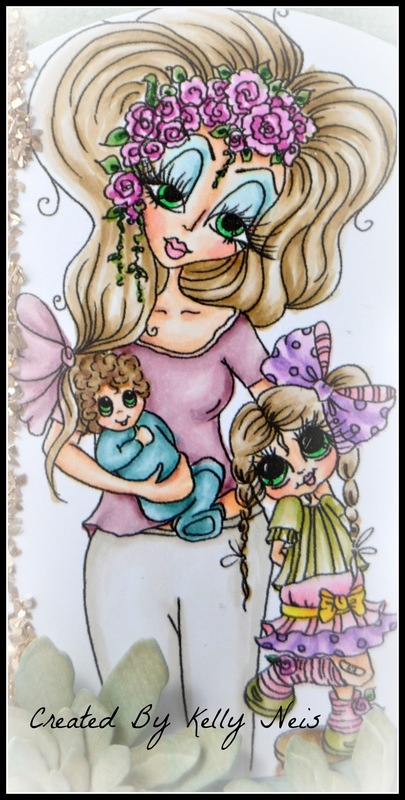 I made a tag using a Sherri Baldy image that reminded me of my mom, always had her arms full when she came over for a visit. Sherri herself just became a grandmother also, congrats! Wishing all current and future Grandma's a lot of joy and happiness over the holidays playing with those kids, they keep you young ya know! 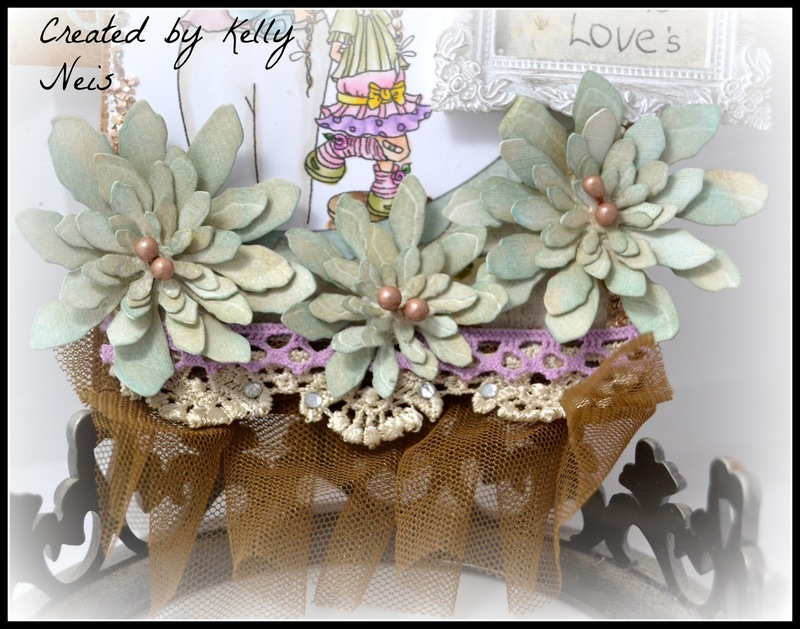 KELLY, Kelly, Kelly... my gosh but this is pretty and I love, love, love the tag! Fab colouring and I also really like those flowers and pretty sparkly bits you added. Really, it's a gorgeous tag! What a beautiful tag you have created! Love the pale colors. 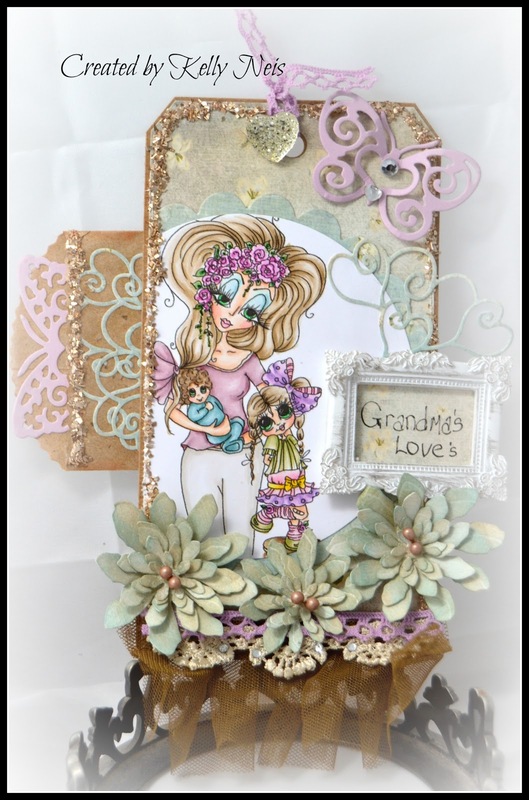 The flowers and die cuts are fabulous!!! Hey also have a Blessed Thanksgiving and enjoy the family time! Hey try not to break anything while preparing your meal. LOL! Oh Anne - you are every bit as pretty as the image on Kelly's card. Kelly you don't know what fun is until you take your grandchildren traveling with you or keep them for a week - no parents allowed. The image is just as cute as it can be - especially the little girl!! We are taking a grandson to Peru next summer and are so excited. We had two of the girls in Wyoming and South Dakota last summer. Mount Rushmore is very impressive as well a Crazy Horse. I know that Art and I are giving our grand kids fond memories and wonderful and educational adventures. Old Faithful is quite impressive!! As always, a wonderful card. Hey, I hear South Dakota is a tax free state!!! This is gorgeous Kelly. A beautiful image with such a lot of thought behind the tag. I am going to be a Grandma again in 3 weeks. So looking forward to it. Such a gorgeous tag. I just love your flowers with the lace and ribbons. Love when my grandchildren come for a visit - always so interesting - you never know what they might say next. And we have so much fun! Brilliant colouring skills as ever - love that 1970s eyeshadow!! - and the flowers along the bottom are completely gorgeous.